The greatest impact biopharming will have on the world’s medicine cabinet is one of supply – it will dramatically boost the availability of biopharmaceuticals, also known as ‘biologics’. Biologics are defined as medicinal products extracted from or produced by biological systems – many are made by genetically manipulating cells of bacterial, animal or human origin. The majority of biologics are proteins such as hormones, enzymes, growth factors and antibodies, which can be collectively called therapeutic proteins, as well as viral proteins for use in vaccines. A review of the scientific literature shows that a slew of antibody-based drugs manufactured in transgenic animals are poised to enter the market as soon as their branded competitors’ patents expire. Traditionally, this would result in the transgenic animal-manufactured drugs being labelled as generic drugs – a non-patented, cheaper alternative to brand-name medications with the same active ingredient. But because the antibodies that the transgenic animals produce are extremely complex monoclonal antibodies – large protein-based structures that specifically recognise one part of a target molecule – no two are alike. This means that, unlike the less complex ‘small molecule’ (non protein) structure of most drugs, they cannot technically be called generics. “When GTC Biotherapeutics start marketing Herceptin from transgenic cows, it will be classed as a biosimilar, not a biogeneric. We may even end up having a better Herceptin, what we’d call a ‘biobetter’,” notes Heiden. The ‘better’ refers to aspects of a drug’s profile that may be more desirable than those of its competitor, such as better efficacy or fewer side effects. These traits will affect pricing, but biosimilars will still be cheaper. 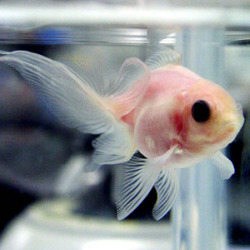 These transparent animals are a response to increasing pressure from animal rights groups over dissections, as they provide a rare opportunity to see the 3-dimensional arrangement of internal organs in a living creature… but who knows what demands might be created once these critters hit the pet stores? It’s a new year, and we have new fiction at Futurismic once again, courtesy of a familiar face. We’ve published more stories by Jason Stoddard than any one other author, and if you can read White Swan and still wonder why that is… well, I don’t know what to tell you! The tiny room stinks of kid-sweat and puke, and greasy Portland rain, endless, rattles the thin plastic window. Little Beny thrashes in his narrow bed, clawing unseen monsters. This is the hardest time, Lili Antila thinks. Lili blinks back tears and turns to the wall, which is playing one of her favorite movies on a window not much bigger than her hand: Bad Girl. A black-and-white James Dunn is waxing on about his dream of owning a radio store. Lili knows what a radio store is. A physical location to house goods for sale, electronics so hopelessly primitive that they were not even interactive. She also knows it is a sad and impossible dream in the First Depression. The screen is smart enough to know this, and it displays the movie with no floaters, no contextual hints. What Are The Animals Becoming? Since I went for things made of metal skins and electrical guts last month when I wrote about weird robots, I decided to opt for warm-blooded carbon-based life forms this time around – so welcome to the December column on smart animals! 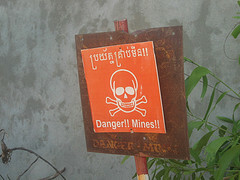 An alarmingly large amount of the world’s surface is strewn with landmines left behind after conflicts of one sort or another, leaving the locals at risk of death and mutilation long after the dispute that caused them to be laid down has ended (or moved elsewhere). Bacteria which glow green in the presence of explosives could provide a cheap and safe way to find hidden landmines, Edinburgh scientists claim. The bugs can be mixed into a colourless solution, which forms green patches when sprayed onto ground where mines are buried. Edinburgh University said the microbes could be dropped by air onto danger areas. Within a few hours, they would indicate where the explosives can be found. The scientists produced the bacteria using a new technique called BioBricking, which manipulates packages of DNA.